Is 8 Seconds Enough Time to Glimpse the Next Big Thing in Social Video? Ocho, the latest entry into the social video space, thinks so. And all they're asking for is 8 seconds to prove it to you. Admittedly, social video -- loosely defined as the use of video as the central organizing element for social interaction and storytelling online -- is a crowded, highly-congested space. It's also one of the most coveted. According to a recent study by Cisco, in 2013 video accounted for 66% of all global internet traffic. An impressive statistic, to be sure. But what's even more impressive is that number is expected to reach a whopping 79% by 2018. And one of the biggest contributing factors to that astronomical growth-- social video. So, in case you were wondering why social video apps like Instagram, Snapchat and Vine are being tagged with valuations in excess of $1 billion, well, now you know. The astonishing growth of social video offers some rationale why some of the biggest brands, marketers and entertainment companies aren't just embracing social video as a way to define their message; they're using these platforms as a way to define themselves. It also offers insight why top-tier investors like Mark Cuban, Bill Lohse's Social Starts and General Assembly co-founder Matt Brimer recently invested in Ocho. I recently sat down with Jonathan Swerdlin and Jourdan Urbach, co-founders of Ocho, to learn more about why text-based communication is on the way out; how Ocho got Mark Cuban to buy in; and what the future of video looks like...in 8 seconds. Ocho has been in the press a lot in the aftermath of your recent raise. But for those who don't already know, tell us what Ocho does. 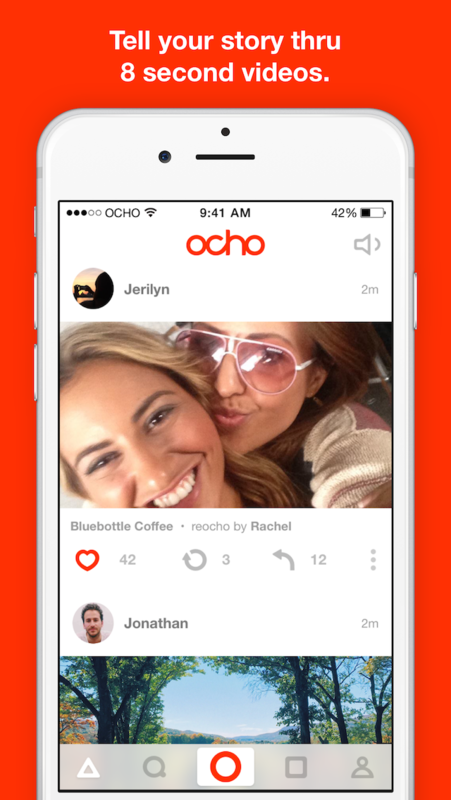 Ocho is an entirely new type of social network driven by video, which approximates real life better than anything else. Is 8 seconds enough time to tell your story? Ocho thinks so. So what was the inspiration for Ocho? And the answer was Ocho? We consider Ocho less of an idea and more of an evolution of social media, the Internet and, more broadly, human interaction. So who else is doing what you do? The natural reaction is to jump to Instagram and Vine, but the truth is all three of us are serving a unique purpose. Instagram is the best photo app in the world, but was not built for video and that's evident in the User Experience. Vine, likewise, is the best app in the world for Vines -- short square comedy skits or stop motion art. But again, it's not a platform that does video justice, and the usage patterns demonstrate that. Ocho's platform allows users to reimagine the way they see and share their world with a built-for-video viewing experience made specifically for the way we process information now--8 seconds at a time and without limits. No one has really created a video-driven social network for the masses. And now that we have the mobile and behavioral advances to support it, we are taking on the challenge. You mentioned your initial inspiration was, 'What would YouTube look like if it launched today?' Thoughts on YouTube founder Chad Hurley and Steven Chen's MixBit? It's interesting you ask about MixBit. In my personal opinion, MixBit is part of a generation of apps that were afraid to build video platforms without a gimmick-- you know, "This is the app for collaborating with friends on videos," or "This is the app for putting music on your videos," or "This is the app for making videos into GIFs." And while many of those have seen limited success, we still believe that the elusive "Instagram of Video" (which is certainly not Instagram - even with video) will not be ridden with gimmicks; it will look like Ocho. A solid video platform with just the tools you need to create and consume great video on mobile, and nothing else. So what does Ocho do differently? The quality of Ocho's video editing suite, including its full spectrum of customization options (dynamic made-for-video filters, voice-over narration, volume control), as well as the ability to interact directly with friends and followers, are just some of Ocho's top differentiators. We also allow users to shoot in widescreen, no matter which way they prefer to hold their phone. This means that we're taking advantage of the new, larger iPhone screens better than anyone else. The 'made-for-video' filters are reminiscent of Instagram's photo filters-- were they an inspiration? When you're building a social media app in this day and age, of course, Instagram will be an inspiration. In fact, our whole mission at Ocho is to do for mobile video what Instagram did for photos on mobile. But filters are just part of the equation. A platform has to be designed for its medium -- you can't just shoehorn the medium in later. That's why we have voice-over, video reply, widescreen, and the millions of other little features that only come when the people building the app are absolutely obsessed with the medium of video. So how exactly does Ocho work? Said another way, what's the 'secret sauce'? Because there are so many proprietary moving parts we had to build from scratch, there are a lot of different ways to answer that question. Right now our "hero" on the front end is the iOS app, but we've also built out a robust web experience. And we are currently looking to aggressively build front ends in Android, responsive web, and even emerging wearable devices. But, as with so many things at Ocho, 'stay tuned'. How is video disrupting traditional text-based communication? We believe that video is disrupting traditional text-based communication with the steady advances that many social networks have been making in the past few years to incorporate video into their platforms. Ocho takes this notion a step further by eliminating text entirely and allowing users to communicate solely through video. Eliminating text altogether? Can you talk a little bit about how that works? It goes back to communication. Seeing text is great, but it's never going to be the same as hearing a voice or seeing a face. And it's certainly not the same as experiencing life through the literal lens of someone you care about. Ocho is about life through the lens. Whether it's your lens, your friends' lens, your families' lens, or the lenses of the celebrities and influencers you care about. And at the end of the day, a lens is a lot closer to real life than some type font. When holograms or 'smellovision' come around and whack us on the behind we'll let you know, but until then video is king. Who is your customer? How will you acquire them? How will you keep them? Ocho is built for anyone who wants to use video to interact with the people they care about in the most beautiful way possible. During beta, we were extremely lucky to have developed an incredibly engaged, authentic community. Now that we have them, I think the best way to keep users is to protect the value proposition that brought them to our product in the first place. That means being rigorous around new features, not breaking core user promises, and maintaining the same level of innovation throughout the company's lifetime as was crucial to its founding. So who's using Ocho now? Ocho's users include entertainers, athletes, musicians, and people living and sharing their lives all over the world. And how will you make money? Fortunately, we have the advantage of learning from various other social networks about what consumers like and feel comfortable with. We launched Ocho with a number of strategic partners, including VICE Sports. The reason we did that was to make sure that our content is inclusive and appealing to a wide range of users. In the future, we'll be exploring new ways to distribute content and foster engagement with audiences for brands. Already, we have several exciting initiatives in the pipeline that, we believe, will broaden our user base even further. Our biggest risk is that we will meddle too much with our platform and drive away our users. Right now, we've given them a platform they love to use, and they do so with minimal interaction from us. If we get cocky and start manipulating the experience or violating trust, our users will let us know and we'll pay for it. Failure on a micro scale is necessary. When you A/B test features, the entire point is to make one or both of them fail to protect the mainline product experience. Failure on a macro scale, where we lose our team and platform, is not something we're planning for. In fact, our success on the macro scale will almost definitely be tied to the quality of failures we induce on the micro scale. We believe we're building the most powerful platform for human connection in the history of the Internet. The only benchmark we care about is that our users continue to love and contribute to our community. Downloads are meaningless without engagement, and our community is blessed with extraordinary contributors, whether they shoot beautiful art or just their beautiful lives. What happens when Google decides to do what you're doing? To have our concept proven out in such fantastic fashion would certainly be flattering. But in all seriousness, as I mentioned before, video over mobile is no joke. You don't just "turn on" an app like Ocho. The value proposition goes way beyond the core code. It extends into the heart of the user experience. I think in the scenario you suggest, a partnership would make a lot more sense to the vaunted Google brass than outright imitation-- that's not in their culture as a company, and it certainly wouldn't be a simple proposition. What can you tell me about the team? Our team splits pretty evenly between community management, partnerships, and development, with a slight bias towards engineering and emphasis on product. We have some of the most talented people in New York working across our roster, and we apply the same hiring rigor to our office manager as we do to our full stack programmers and designers. More than anything, they're just damn cool, too. And that makes coming to work fun. Okay, I just have to know. How did you get Mark Cuban's attention? He heard about what we were doing through mutual friends involved with Cyberdust and wanted to get involved. He came into the round on the same terms as the rest of our investors, who are equally impressive if less well known. Indeed. Bill Lohse and Matt Brimer--both of whom came in on the round with Cuban--are two of the most astute investors out there. Now, say someone wants to get to you? What's the best way to get in touch? Couple of ways. You can find us on the Ocho website; on Facebook; on Twitter; and good old email. Well, what do you think? 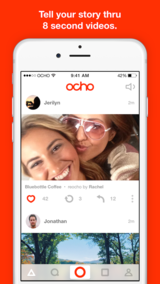 Is Ocho the next big thing in social video? Time will tell. Apparently, it won't take long, however... 8 seconds, to be exact.